Wessex Astrologer, ISBN 10: 1902405188, 212 pages; 2006. £15.95 + P&P. Declination has so much to offer! Paul Newman dances In and Out of Bounds touching every corner of the sky in this 'slim volume.' He has beaten the bounds of his subject in the most entertaining way, and I now eagerly incorporate declination and antiscia in all of my sessions with clients, expecting and finding startling new revelations. Newman starts off with a clear and simple description of declination, its rules and the extra space it provides in astrology for finding hidden connections and disconnects in the chart. The segment 'The Earth as a kingdom in liege to the Sun' (p.173) is a reminder that we must 'live cyclically in tune with other solar rhythms' to fully appreciate that this is not a linear day-by-day journey of the Sun through the year because 'the Sun by declination moves at various speeds through the degrees north and south and retraces its steps.' In other words the Sun dances rather that walks in a straight line through the year. Gawain and the Green Knight and the Twelve Days of Christmas are delicious illustrations he uses to explain the solar festivals along with the The Royal Arch of the Masons, a totally mysterious presentation of occult symbols until you realize that this represents the journey of the Sun from vernal to autumnal equinox, with connection to the grades of the Masonic Order. It's so simple, really! Arthur, a solar king marks four important festivals of the year as he pulls the sword from the stone on Christmas, Candlemas (February 2), Easter and Pentecost. At each of these four markers, the solstice, the fire festival of Imbolc, the solar and lunar celebrations of Easter and Pentecost, he proves his worthiness to be king. I have often puzzled over the repeated references to Pentecost in Malory, and now have a part of the answer. Newman continues this wonderful romp through the treasures of latitude, with a series of charts with Out of Bounds planets to explain how we might interpret these forays of planets north and south of the ecliptic. What does it portend when a planet has left the safe and narrow path of the Sun? He uses the starting time for the creation of Tarzan and the Apes as an example of out of bounds Mercury and Mars, which, is repeated in Edgar Rice Burroughs' chart. He compares the Out of Bounds ("OOB") Planets of two astrologers: Ronald Davison and John Addey, and follows that up with an investigation of the Lone Ranger and the state of Texas. Then there's the chart of the Abbey Road album cover and a comparison of Rudolph Valentino and Liberace, each with an OOB Venus. There's more to this wonderful exploration, but I will leave some of the surprises for you to discover. Next comes an analysis of the predominance of northern vs. southern hemisphere planets. He chooses two television genres. Soap operas belong to the southern hemisphere; science fiction belongs to the north. Hilarious examples are provided. The Rime of the Ancient Mariner brings us to the Crossing of the Line-and to the 0º point, the equator. a place of great stillness and retribution. Antiscia using the example of Dr. Jekyll and Mr. Hyde, becomes a symbol of the karmic intrusion reflected in author Robert Louis Stevenson's chart. We discover the antiscia between Stevenson's Scorpio Sun and his Moon's South Node in Aquarius, repeated in their almost exact parallel declination, a double message of the impossibility of keeping the shadow of the past (Mr. Hyde) in restraint (Dr. Jekyll). The chapter "Stars in Declination" uses the opening of the tomb of Tutankhamen and the fate of the archaeologist and his financial backer; both benefit from the Sirius Aldebaran connection by latitude to Venus and Jupiter in the chart and then are overcome by the Neptune conjunction to Aldebaran. Stonehenge is not forgotten. In very simple and clear language Newman show us how ancient astronomers built a magnificent 'standstill' temple to the Sun and Moon that was a marker of turning points. And to make this personally intriguing, Newman suggests we use the calendar dates of antiscia to our Sun, contra parallels to the Sun and the antiscion to that date to discover four 'annual energy boosts' in our charts. Declination in Astrology contains some very useful miscellaneous information in the appendix section, which is definitely not a vestigial organ to this book. The chapters "Ecliptic and Equator Astronomy" clarify some of the astrological assumptions, "Named Stars and their Declinations" provides a handy pocket guide to this subject, and Newman throws in some intriguing ideas about Yods and the difference between a contra parallel in latitude and an opposition along the ecliptic. This book is a treasure. 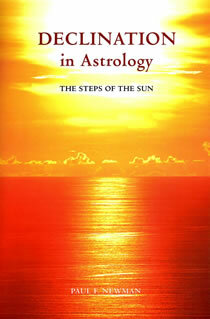 Read it and chuckle, it's an invitation to a creative examination of the basic construction of astrology. You will want to carry Declinations around, in and out of bounds, and discover new heights and depths to your practice. And isn't this the perfect moment to discover declination! Mercury is quite far out of bounds, Mars is pushing the limits and Saturn and Jupiter are parallel, offering the opportunity to begin a new cycle.